You can always trust Amber Heard to bring sensual femininity to a red carpet event. Amber dressed to the nines for the “Justice League” premiere to join Gal Gadot and a slew of other big-name stars in the cast. She enlisted the help of Versace and Christian Louboutin for her stunning look, which brought out Amber’s innate sultriness. Amber Heard at the “Justice League” premiere held at the Dolby Theater in Hollywood, California, on November 13, 2017. The 31-year-old actress looked divine in a black Spring 2017 gown from Atelier Versace, which featured draped netting and beaded embellishments. It also had cut-out details, a flirty thigh-high slit and a short train. Amber styled it with an edgy updo that showed off her gorgeous face and Eva Fehren statement earrings. She rounded out her glamorous look with a red pout and a pair of Christian Louboutin pumps. While a pair of strappy heels would have made it a perfect premiere look, Amber’s “Body Strass” pumps still complemented her sultry gown. 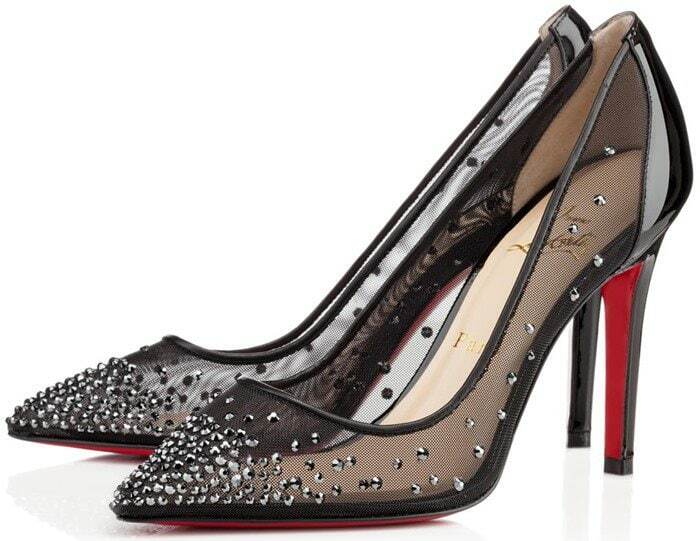 These shoes feature a pointy-toe silhouette and mesh uppers with round crystal embellishments. They also have low-cut vamps, covered heels and the brand’s signature red leather soles. These heels are currently unavailable, but you can shop for other Christian Louboutin shoes at Bergdorf Goodman, Neiman Marcus and Nordstrom. What do you think of Amber Heard’s premiere look?